The BBC has sent an email to pre-registrants for its new on-demand trial. The service, previously mooted as the iPlayer, is referred to in the email as the BBC Archive Trial . Ashley Highfield, the BBC's director of future media andechnology, announced the trial would be going ahead at the Broadcast IPTV Explained conference back in December. It could last up to six months. "We thought you'd like to know that we're in the final stages of preparations for the trial," says the mail, which is signed from 'the BBC archive trial team'. "We'll email you your account details in just a few weeks and then you'll have access to hundreds of hours of programmes." There is also a hint of the kind of content that will be on offer. And it's pretty broad. "We'll be bringing you a range of radio and television programmes from the 1930s right up to the 21st Century, including dramas, comedies, variety shows and some stunning documentaries. "You'll also be able to witness key moments in history, discover the lives and stories of incredible people, and see well-known faces in their first TV appearances." User feedback on the service will be very much the order of the day. "We'll be back in touch with more information very soon, but for now we'd just like to thank you for registering and let you know how much we're looking forward to hearing your thoughts on the trial," finished the mail. Registration has now closed for the trial. Not registered? 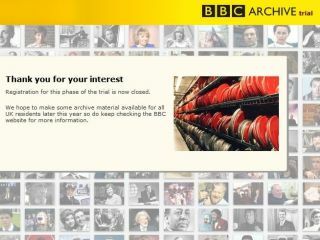 Fear not - the site says the BBC hopes "to make some archive material available for all UK residents later this year." The service has now passed the PVT, or Public Value Test, which the BBC needs for all new services funded by the licence fee.